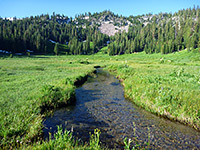 Trails in Lassen Volcanic National Park are mostly easy to moderate in difficulty, and varied in the terrain they traverse - paths lead to summits, volcanic features, waterfalls, lakes, meadows and active geothermal areas. Most of the day hikes are accessed by the main road Highway 89, though some of the most unusual scenery is in the northeast of the park around Butte Lake, and in the south at Warner Valley. Because of the high winter snowfall, most of the trails are open for six months of the year or less. Trails are listed below by destination, though as many paths intersect, there is often more than one route to a particular place. The Lassen Volcanic Map shows the location of each trail - identified by the number. 1 Brokeoff Mountain 3.5 2,600 The southernmost trail in the national park climbs steeply from a pull out near the entrance station, runs alongside a forested creek then rises above the treeline to a ridge on the south side of Brokeoff Mountain, a remnant of ancient Mount Tehama. The last section zig-zags up the south face of the peak to the 9,235 foot summit, for unsurpassed views of the surroundings. Because of the high elevation, the path is not normally free of snow until August. 2 Bumpass Hell Although unspectacular by Yellowstone's standards, Bumpass Hell is the largest thermal area in Lassen, and in summer many visitors walk the easy trail to the basin, starting near Lake Helen (the west route). The location may also be reached from the Kings Creek picnic area trailhead (the east route), a rather more difficult hike of 2.5 miles. The heavy winter snowfall along the trail does not usually melt until the start of July. 3 Cold Boiling Lake 0.7 40 From the end of the side road to Kings Creek picnic area a short trail leads southwards through open woodland to the shallow Cold Boiling Lake, some parts of which gently bubble due to escaping carbon dioxide gas. 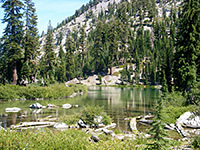 The path forks here; one branch has a steep ascent towards Bumpass Hell while the other descends through a patch of thicker woodland to larger Crumbaugh Lake, enclosed by long grass and reeds. It then crosses a wooded ridge and winds down the hillside beyond towards Mill Creek Falls. 4 Crags Lake 2 850 Several trails begin at the Manzanita Lake Campground; this one runs alongside Manzanita Creek a short distance, traverses a wooded hillside then climbs more steeply close to the edge of the Chaos Jumbles, at the foot of the high, treeless slopes of the Chaos Crags. At the end is a short descent to Crags Lake, a small pool surrounded by volcanic rocks. 5 Devastated Area 0.5 (loop) level This short, paved, interpretive path loops around new growth forest sprinkled with rocks and lava from the 1915 Lassen eruption. Notices along the way have information about the local geology. 6 Echo Lake 1.9 420 Echo is the closest of many lakes in the eastern Lassen backcountry that may be reached from trails starting at the Summit Lake North campground. The path climbs quite gently to a forested plateau then descends a little more steeply to the lake's north shore. Past here the terrain is still cool and forested as the route continues to the two Twin Lakes, 300 feet lower, and to a junction with the Pacific Crest Trail. Several other paths branch off leading to other locations, including volcanic features in the northeast. 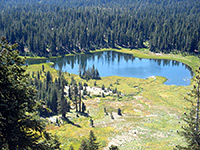 An 11 mile loop - the Cluster Lakes Trail - can be made by continuing north then west to five more lakes, including Feather, Silver, Big Bear and Litle Bear. 7 Lassen Peak 2.4 1,957 Beginning at an already high elevation of 8,500 feet, the well defined trail up the south face of Lassen Peak gains another 2,000 feet as it switchbacks across a steep slope of stones and lava blocks to the wind-swept summit, from where the 360-degree views extend for 80 miles in some directions. Because of snowfall, the trail is only open for several months each year. 8 Kings Creek Falls 1.5 500 The 40 foot waterfall on Kings Creek is a popular destination, suitable for families with children; the path is level at first as it crosses marshy meadowland beside the stream then passes through a belt of thick pine forest to the top of a staircase-like cascade that precedes the falls. It then descends steeply to the brink of the main drop. Two long distance paths fork off en route, to Warner Valley and Corral Meadow. 9 Manzanita Creek 3.5 1,110 Starting at the south edge of Manzanita Lake Campground, one of the longest and least used day hike trails in the park climbs steadily through open pine/fir forest for 2 miles then crosses Manzanita Creek near its upper end. The remainder of the walk is across meadows, patches of woodland and wildflower groves beside the stream, with good views of the volcanic peaks to the south. 10 Manzanita Lake 1.5 (loop) level The Manzanita Lake Trail is popular with residents at the adjacent campsite - the level path circles right round the forested lakeshore, offering views of distant peaks, and a good chance of spotting water-based wildlife. 11 Mill Creek Falls 1.5 300 The highest waterfall in the park is reached by an easy trail that descends gradually through woods and floral meadows to an overlook directly above the drop. The path, now rather less traveled, continues another 1.7 miles to Crumbaugh Lake and then to the Kings Creek picnic area. 12 Paradise Meadows 1.4 700 The Paradise Meadows Trail begins just south of the Devastated Area, first passing close to the east side of Hat Lake then climbing quite steeply up the forested hillside beyond, up to a marshy, flower-filled meadow set in a basin enclosed on three sides by higher cliffs. Just before the meadow, a less used path branches southwest, gaining height steadily over the next 1.2 miles to a junction with the trail to Terrace Lake. 13 Reflection Lake 1.0 (loop) level Just inside the northern national park entrance, two short loop trails visit pretty, tree-lined Reflection Lake and a nearby lily pond. Notices en route describe the local plant life. 14 Ridge Lakes 1.0 1,045 Starting from the parking area next to the Sulphur Works, the short but steep Ridge Lakes Trail ascends a partly wooded hillside to the two interconnected Alpine lakes, situated in a sheltered glacial basin surrounded by colorful, volcanic slopes. 15 Terrace Lake 0.6 350 Three of the prettier lakes in Lassen Volcanic National Park may be accessed from the same trail, a generally easy route that begins along the park road 2 miles east of Lassen Peak. Cliff Lake is the most scenic, set directly beneath the near-vertical north face of Reading Peak. The path continues another 2.4 miles to an alternative starting point beside the Summit Lake North campground. 16 Bathtub Lakes 0.4 100 The two small Bathtub Lakes sit on lightly forested land just north of Butte Lake; a short path leads past the pools, beginning at the end of the access road. 17 Cinder Cone 1.5 850 Cinder Cone is a well preserved volcanic peak, symmetrical in shape, black in color and completely lacking in vegetation - a highlight of the national park yet one that few people see owing to its isolated location. 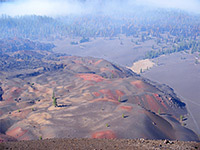 The trail to the summit passes through open woodland alongside the Fantastic Lava Beds and the edge of the Painted Dunes before the difficult climb up shifting cinders and lava to the crater on top of the peak. The path then circles the rim and descends to the floor of the crater. 18 Prospect Peak 3.3 2,277 The strenuous path to the small crater on top of Prospect Peak, an extinct volcano, forks off the Cinder Cone Trail 1/3 mile from the start then climbs steadily up the east face of the peak, through thick forest all the way. The crater rim has no trees so allows fantastic views over the volcanic surroundings. 19 Widow Lake 4.0 1,000 From the end of the Butte Lake Road, this trail winds around the northern and eastern lakeshores, allowing good views of the Fantastic Lava Beds on the opposite side, before entering forested land and climbing ever more steeply up to Widow Lake, near the national park boundary. 20 Boiling Springs Lake 0.8 300 Set in a deep crater in the mixed fir/pine/cedar forest, Boiling Springs Lake contains simmering, acidic, 125°F water and is surrounded by many small vents, pools and mud pots. The path leading to the lake (part of the Pacific Crest Trail) follows a small stream across a meadow then climbs through the trees, circling around the crater rim though not passing particularly close to any of the thermal springs. It then heads further southeast towards Terminal Geyser, a recently-created steaming vent thought to result from nearby drilling operations (since abandoned). 21 Devils Kitchen 2.1 440 Devils Kitchen is the second largest thermal area in Lassen Volcanic National Park, and one that receives far fewer visitors than the main region at Bumpass Hell. 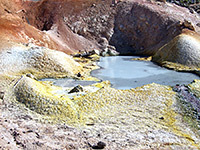 It is reached by an easy trail that crosses a large meadow then leads through thick forest to the rim of the steep-sided valley of Hot Springs Creek, location of many small fumaroles and hot pools. The trail is heavily used by mule trips from the nearby Drakesbad Guest Ranch, so can be rather smelly. Another path branches off southwards and climbs a forested hillside for one mile to Drake Lake, then heads further south, exits the park and meets a track in Lassen National Forest. 22 Crystal Lake 0.4 380 Crystal is one of several small, picturesque lakes in the rocky hills east of Juniper Lake. The short trail to the lake crosses a patch of woodland and emerges into the open near the south shore. 23 Horseshoe Lake 1.4 240 Starting at the end of the unpaved road to Juniper Lake, this wide path (once a vehicle track) passes over a low, wooded ridge to a ranger station on the east shore of Horseshoe Lake, from where three trails fork off; one south back to Juniper Lake, another northwest towards the Twin Lakes and the third north alongside Grassy Creek to Snag Lake. 24 Inspiration Point 0.7 400 Another short trail east of Juniper Lake rises across a forested hillside and patches of meadowland to Inspiration Point - a minor summit, but one high enough for long distance views across much of the national park. 25 Mount Harkness 1.9 1,250 The steep but rewarding path to the summit of 8,048 foot Mount Harkness starts beside the Juniper Lake ranger station, ascends through thick forest at first then more dispersed woodland, arriving after 2 miles at the colorful, volcanic summit, location of an active fire lookout station. A 5.5 mile round trip can be made by descending another trail on the far side of the peak, then returning via a path along the south shore of Juniper Lake.